WELCOME HOME! 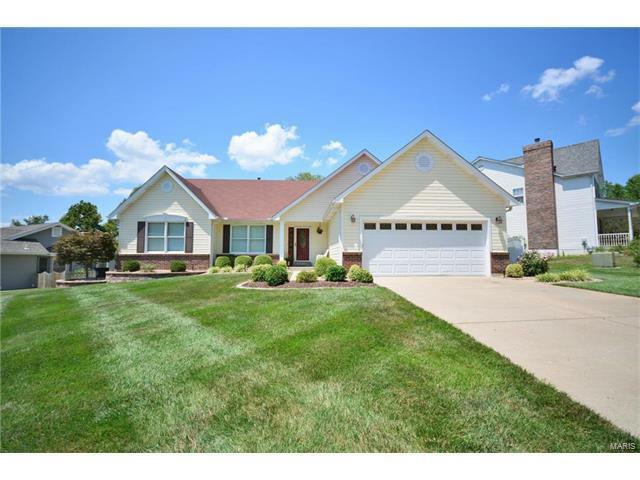 This lovely 4 bedroom, 3 bath ranch sits on a quiet street. So many upgrades! Beautiful kitchen features upgraded maple cabinetry, quartz countertops, stainless steel appliances and ceramic tile floors with the breakfast room and the main floor laundry just steps away. Beautiful hardwood floors in vaulted family room (with gas fireplace) and carpeting in bedrooms. Your master bedroom is an oasis with its private deck and updated master bath with separate soaker tub and shower, granite and ceramic flooring. Two more bedrooms share the updated hall bath with granite and ceramic flooring. Finished lower level affords 4th bedroom with egress, full bath, office, living area with gas fireplace and a large multipurpose room. 'New HVAC and hot water heater*Elfa closet system*Sprinkler system*Paver patio*Insulated/drywalled garage with storage* Clubhouse and pool* Make an appt, it won’t last long! 364 TO Jungs Station, right on Willow Bend, right on Pond Hollow, left on Clarkson Park, right to continue on Clarkson Park, house on left.